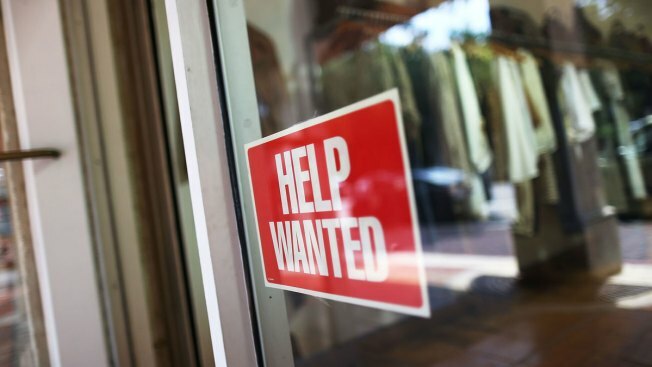 A help wanted sign is seen in the window of the Unika store on September 4, 2015 in Miami, Florida. The economy added 242,000 jobs in the month of February 2016. The economy added 242,000 jobs in the month of February, higher than the 190,000 expected by economists. But the gains aren’t enough to propel wage growth forward, according to NBC News. Hourly wages fell by three cents and dragged the annualized growth number from 2.5 to 2.2 percent. Productivity gains should lead to pay gains for workers, but labor economist Gary Burtless said that hasn’t happened so far. "We certainly don't seem to have workers in strong enough bargaining positions so they can get bigger pay packages each year," said Gary Burtless, a labor economist at the Brookings Institution. "The big problem is that workers have seen their share of the output of American corporations decline." Many of the jobs created in February were in the high- and middle-wage jobs like healthcare and construction, according to the Labor Department.